DH is crazy about falafel! At one time, in the past, we were going to any restaurant he could find that served it, just so he could try their version. I learned a couple of things along the way: I don’t like it when it is seasoned with cheap, yellow curry powder (aka McCormick.) I actually don’t like _anythin_g seasoned with that. I also don’t like them when they are heavy and greasy, without a kind of fluffy interior. I also don’t really like to deep fry things at home, but deep frying is the traditional method of preparation for falafel. So, I’ve been experimenting, and came up with this recipe. DH says it is the best falafel I’ve made so far, and he really liked it, so I think I’ve hit a home run! 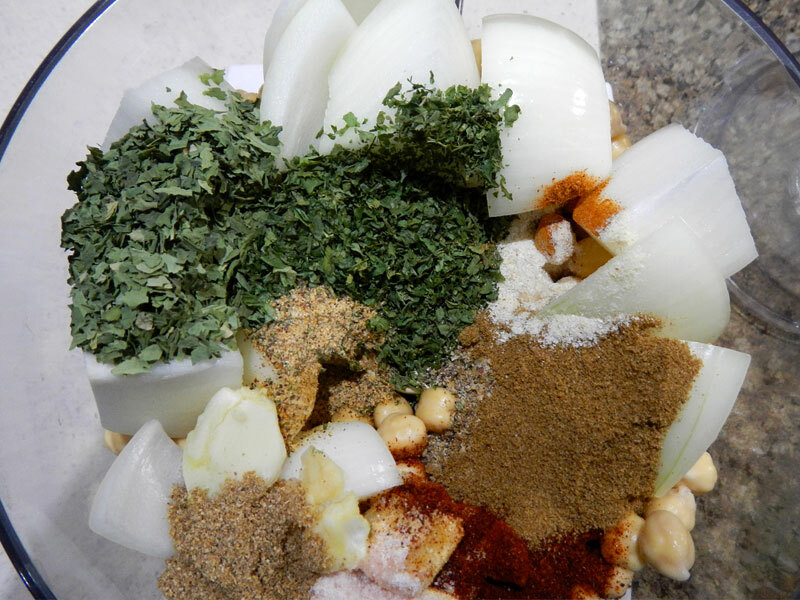 Ahead of time: Put the dry chick peas in a large bowl. Cover with water at least an inch above the chick peas. Soak for 24 hours, changing the water once. 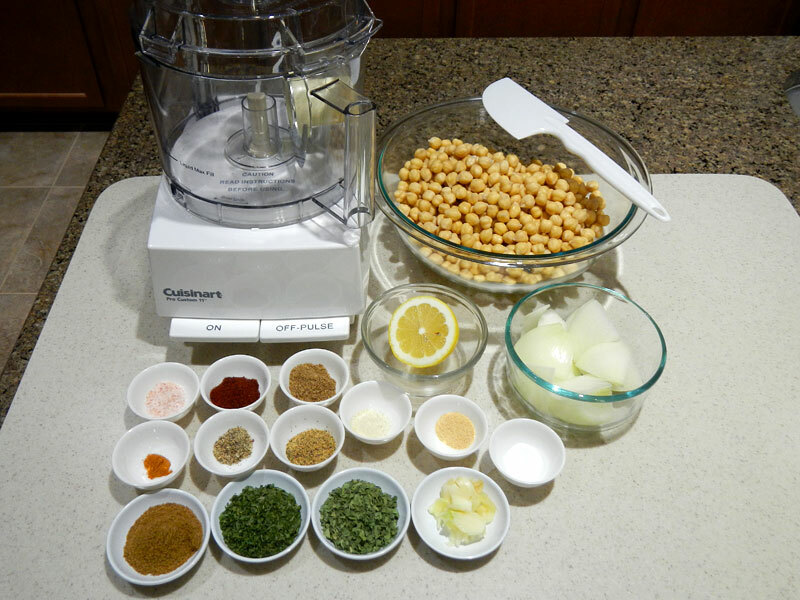 Note: When you soak chick peas, they make popping sounds. Don’t be surprised if they are sometimes quite loud! 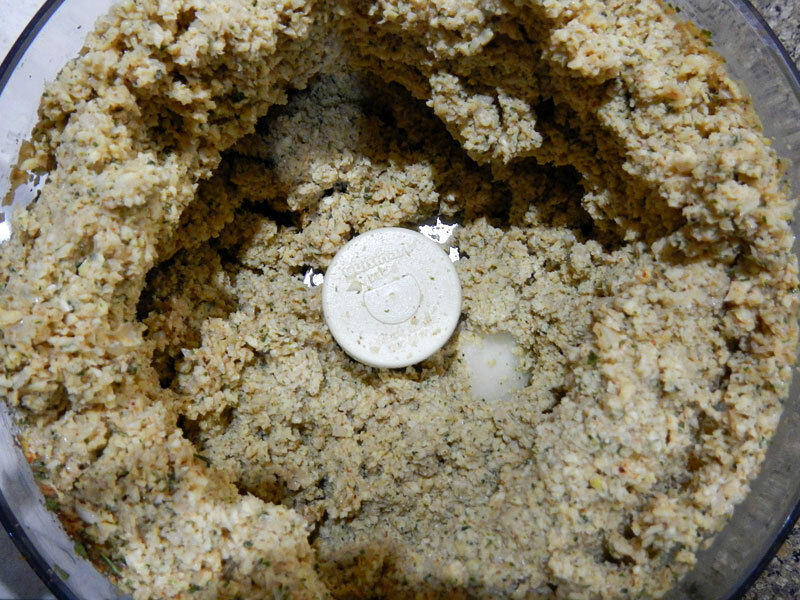 After the chick peas have soaked for a day, drain and rinse them off. Then dump them onto a clean dish towel and pat the excess water off of them. Pulse them a few times, then let the processor run, keeping an eye on it. When I make this, the mixture creeps up the sides of the processor, and doesn’t fall back to the center at the beginning. When that happens, stop the processor. As you can see here, there is a piece of onion that isn’t getting chopped, and the mixture is stuck on the sides. Stop and scrape everything down and towards the center. 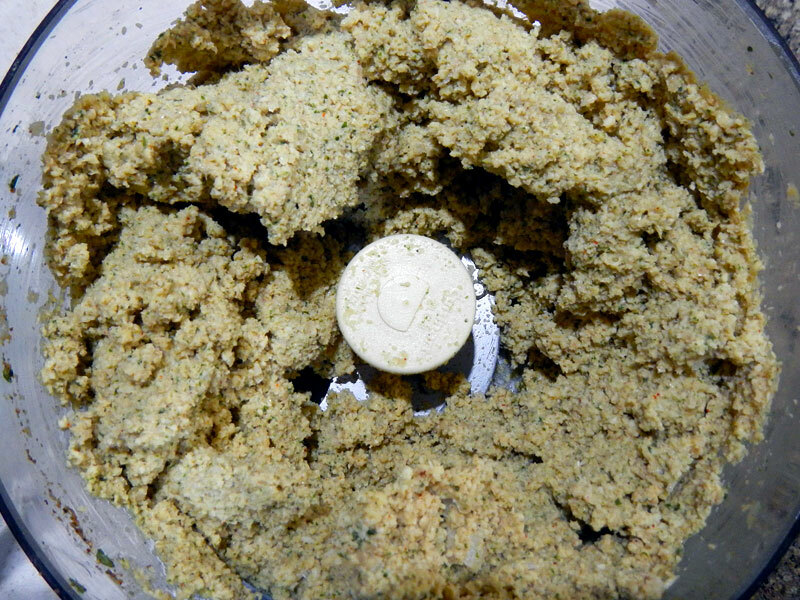 Continue processing, stopping, scraping the sides until everything is a fine texture, but not hummus! It should look like this. It should be falling down off the sides, and have a bit of texture to it. This mixture is fairly dry. It should have just enough moisture to form into a ball or patty, but not be very wet. If you can do this, it’s right. If it is too dry, you can add a little water by sprinkling it in with your fingers and mixing. 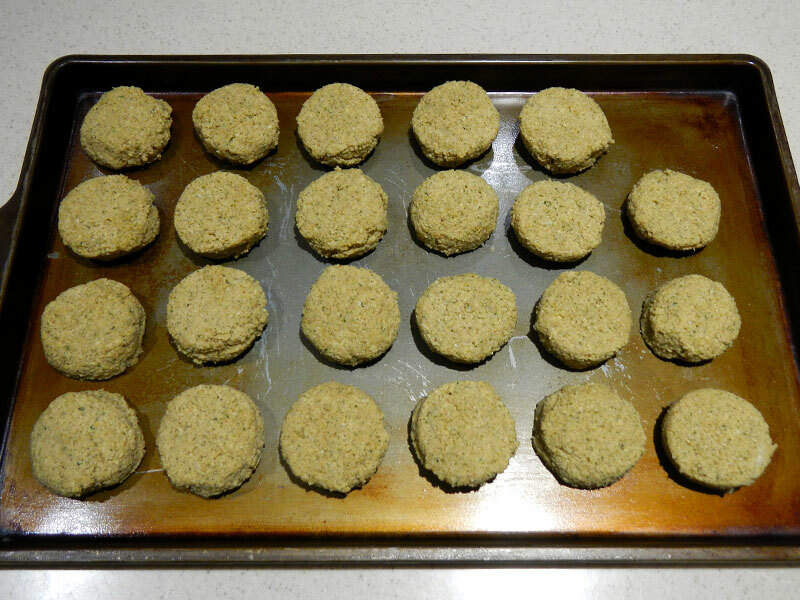 When the mixture is the right consistency, form the mixture into patties and arrange them on a cookie sheet. 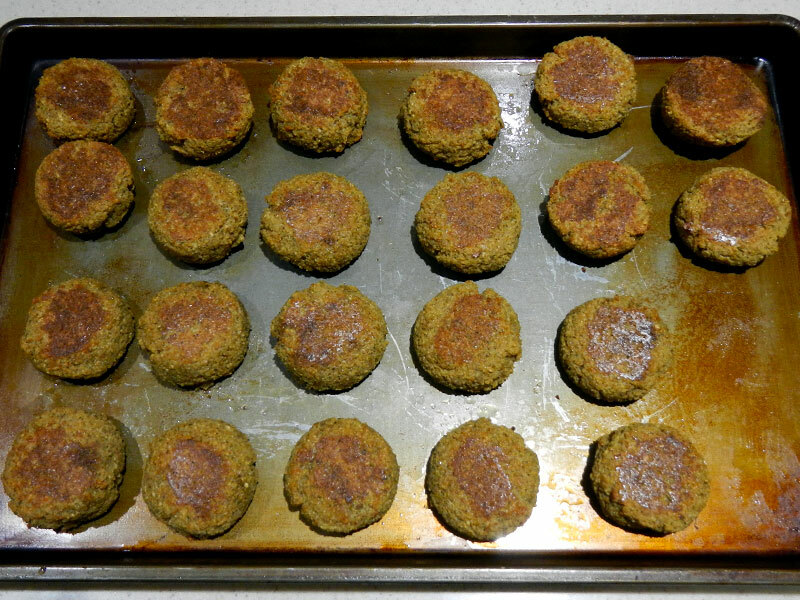 When the oven is hot, put the tray of falafel patties on a rack in the middle of the oven. After they have baked for 15 minutes, brush the tops with a little canola oil. Continue baking for 10 minutes. Turn the patties over, brush with a little more oil. Bake for another 10-15 minutes, or until they are dry inside and browned on both sides. Note: Total baking time is about 40 minutes. They look like this when done. These will keep in the refrigerator for several days. They can be eaten hot or cold. The worse thing that can happen if you soak the chick peas too long is that they might sprout. No problem! Sprouted chick peas work just fine and are good for you. You can soak the chick peas ahead of time. Just drain off the water, and rinse them, and put them in a covered container in the refrigerator. (You don’t have to pat them dry.) Rinse them with clean water once a day. If you keep them in the refrigerator too long, they might sour. Just make sure you rinse them every day. I’ve kept them up to 5 days with no problem. 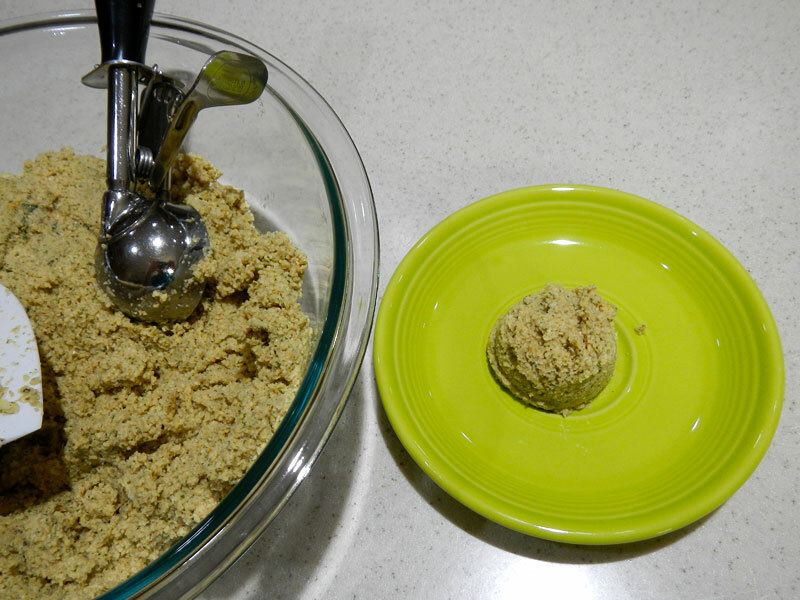 If the mixture is too wet, and you have some on hand, you can add a little chick pea flower to absorb the extra liquid. These have a nice, crunchy exterior and a soft, fluffy interior. They still have the taste and fat mouth feel of the fried ones, but with way less oil. And you won’t make a mess out of your stove deep frying them! 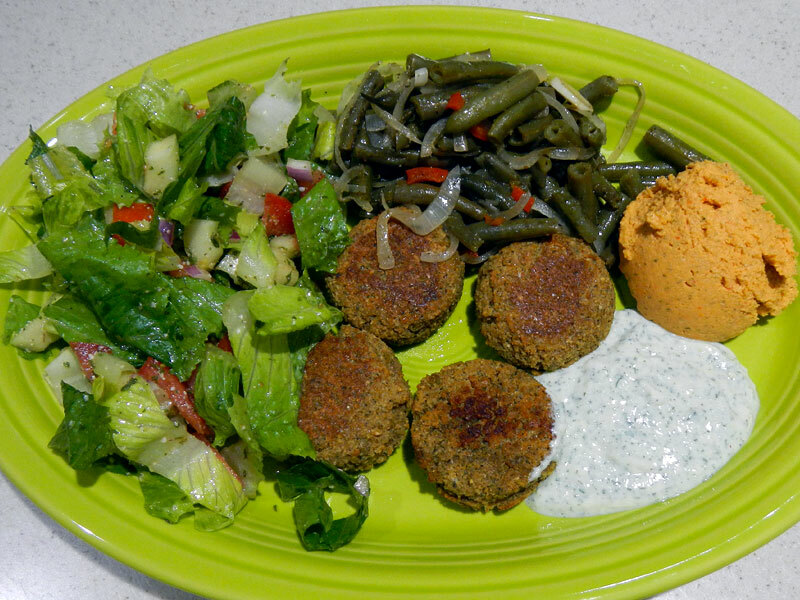 We had them for dinner with vegan tzatziki, Greek salad, roasted red pepper hummus, and hot pickled green beans!